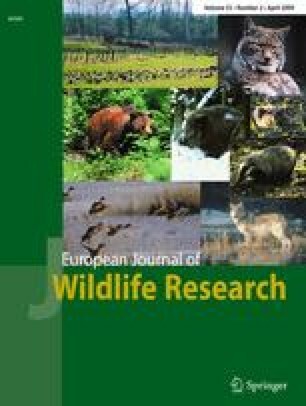 We conducted spotlight counts from 1992 to 2006 in 59 localities to describe carnivore presence, distribution and relative abundance in open agriculture lands in Aragon, northeastern Spain. During the study period, urban waste and carcases of domestic livestock became less available to wild animals, and rabbit (Oryctolagus cuniculus) abundance was low after rabbit haemorragic disease. We calculated a kilometric abundance index (KAI, individuals seen per 100 km surveyed) and the ratio between the number of positive localities in which a species was detected and the total of localities surveyed in a year. Indices to abundance and presence included: red fox (Vulpes vulpes), KAI per 100 km 10.70 and 100.0% localities per year; stray dog (Canis familiaris), KAI 0.48 and 22.6% localities; wildcat (Felis silvestris), KAI 0.10 and 19.1% localities; domestic cat (Felis catus), KAI 0.21 and 20.6% localities; polecat (Mustela putorius), KAI 0.02 and 2.0% localities; badger (Meles meles), KAI 0.16 and 23.6% localities; stone marten (Martes foina), KAI 0.11 and 19.6% localities; weasel (Mustela nivalis), KAI 0.002 and 0.6% localities; and genet (Genetta genetta), KAI 0.06 and 10.0% localities. Indices of badger abundance increased significantly, whereas indices of stray dogs decreased significantly over the study period. Abundance indices of red fox, the most important predator of small game, were stable throughout the study period. No significant trend was observed to other studied species. This study concludes that Aragon region maintains a diverse and rather stable carnivore community and shows that large scale data may help to identify trends of the more abundant wild and feral carnivores. We are indebted to two anonymous referees whose comments greatly improved the quality of the paper. We thank Rangers of the Fish and Game Service, Aragón Government, and with the staff of Ebronatura. We thank F. Ruiz-Fons for helpful advice and English revision. RS has a Ph.D. grant from Junta de Comunidades de Castilla-La Mancha, and PA is currently enjoying a Juan de la Cierva research contract awarded by the Ministerio de Educación y Ciencia (MEC).